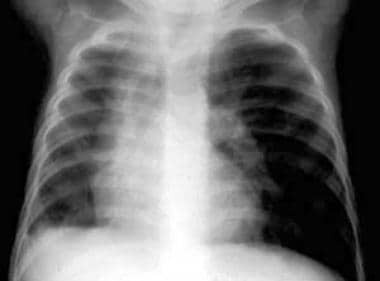 Anteroposterior chest radiograph of a 12-month-old patient indicates diffuse pneumonia that is clearing on the right. Radiograph of the same infant shown in the previous image, now 20 months of age. The pneumonia has cleared. The left lung is hyperlucent and is overexpanded. The right lung is small. The patient was asymptomatic at this time. Diagnosis is made radiographically by x-ray and CT scan and is an incidental finding in some cases. On CT scan, the affected lung displays small size and decreased vascularity, hyperexpansion and hyperlucency, and, rarely, bronchiectasis. For patients with Swyer-James syndrome, chest CT scanning with thin collimation sections on inspiration and expiration is the preferred examination. [12, 1] The appearance of the lungs on forced expiration is important in the assessment of SJS with CT scanning; therefore, the patient's cooperation is essential. The patient should be placed in the prone position to help identify the typical mosaic pattern of the syndrome. Small regions of hyperlucency representing air trapping are reported in some patients. Adenovirus infection is considered the most usual cause. 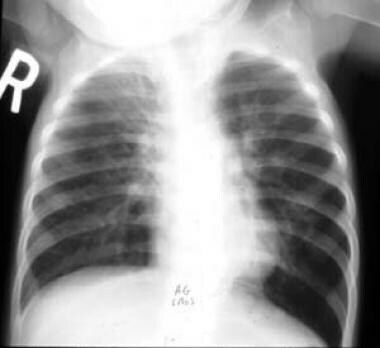 X-ray of a 4-month-old child shows pneumonia centrally throughout the right lung. 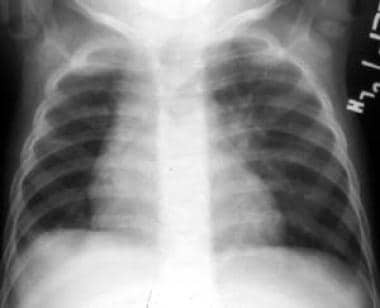 Pneumonia was caused by a severe respiratory syncytial virus infection. Same child shown in the previous image, now 8 years of age. The patient was experiencing severe wheezing and episodes of hypoxemia. Note the small right lung and overexpansion of the left lung. A febrile, ill, 3-month-old infant with rales and rhonchi, which are more severe on the left than the right. The same patient shown in the previous image, now 12 years of age. Frontal radiograph shows the left lung to be somewhat small and hyperlucent. The organism that caused the original pneumonia was cytomegalovirus. The disparity in size between the 2 lungs may represent a hypoplastic pulmonary artery or congenital hypoplasia of the lung. A comparison with a previous set of radiographs helps with the differential diagnosis. A history of severe lung infection also helps in making the diagnosis. On ventilation-perfusion lung scanning, diminished activity of the affected lung is seen with perfusion scanning, and decreased gas exchange is seen during the ventilatory phase. The lung perfusion deficit seen in patients with Swyer-James syndrome occurs because the peripheral branches of the pulmonary vessels have not developed normally, and vasculature is arrested at the stage at which the causative infection occurred. 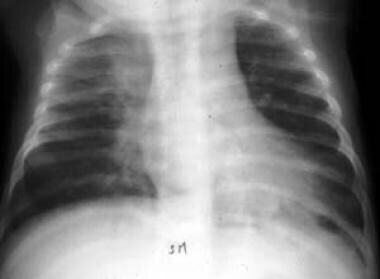 Any disorder involving distal airway obstruction (ie, bronchiolitis obliterans, asthma, congenital lobar emphysema) may present in the same manner as Swyer-James syndrome, resulting in a false-positive result. In patients with Swyer-James syndrome, the pulmonary artery and its branches are small and hypoplastic on the involved side. Collateral vessels may be present, but they are unusual. Sen HS, Taylan M, Abakay O, Sezgi C, Cetincakmak MG. Adult diagnosis of Swyer-James-Macleod syndrome: retrospective analysis of four cases. Respir Care. 2014 Apr. 59 (4):e51-4. [Medline]. [Full Text]. Kawasuji H, Suzuki K, Furuse H, Tsuda T, Masaki Y, Taniguchi H. Multimodal imaging findings in an adult case of Swyer-James-MacLeod syndrome. Respirol Case Rep. 2017 Jul. 5 (4):e00236. [Medline]. [Full Text]. 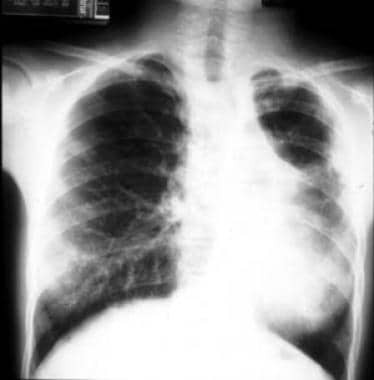 Turcu DV, Dupa SC, Turcanu A, Mihaescu T. A Case of Unilateral Hyperlucency of the Lung: a Rare Adult Occurrence of Swyer-James-MacLeod Syndrome. Maedica (Buchar). 2018 Jun. 13 (2):143-146. [Medline]. [Full Text]. Machado D, Lima F, Marques C, Monteiro R. Swyer-James-Macleod syndrome as a rare cause of unilateral hyperlucent lung: Three case reports. Medicine (Baltimore). 2019 Feb. 98 (6):e14269. [Medline]. Gopinath A, Strigun D, Banyopadhyay T. Swyer-James syndrome. Conn Med. 2005 Jun-Jul. 69 (6):325-7. [Medline]. Ghossain MA, Achkar A, Buy JN, Rochemaure J, Vadrot D. Swyer-James syndrome documented by spiral CT angiography and high resolution inspiratory and expiratory CT: an accurate single modality exploration. J Comput Assist Tomogr. 1997 Jul-Aug. 21 (4):616-8. [Medline]. Braunschweig M, Gal I. Swyer-James syndrome. JBR-BTR. 2001 Apr. 84 (2):57. [Medline]. Khalil KF, Saeed W. Swyer-James-MacLeod Syndrome. J Coll Physicians Surg Pak. 2008 Mar. 18(3):190-2. [Medline]. Chaucer B, Chevenon M, Toro C, Lemma T, Grageda M. Swyer-James-Macleod syndrome: a rare finding and important differential in the ED setting. Am J Emerg Med. 2016 Jul. 34 (7):1329.e3-4. [Medline]. [Full Text]. Akgedik R, Karamanli H, Aytekin İ, Kurt AB, Öztürk H, Dağlı CE. 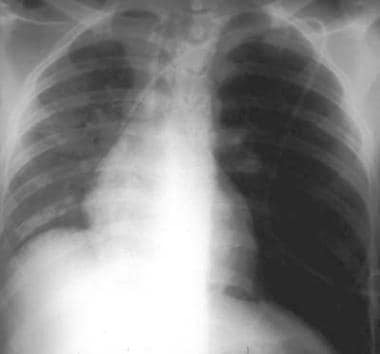 Swyer-James-Macleod syndrome mimicking an acute pulmonary embolism: a report of six adult cases and a retrospective analysis. Clin Respir J. 2018 Feb. 12 (2):404-409. [Medline]. Dirweesh A, Alvarez C, Khan M, Shah N. A unilateral hyperlucent lung - Swyer-James syndrome: A case report and literature review. Respir Med Case Rep. 2017. 20:104-106. [Medline]. [Full Text]. Dornia C, Pfeifer M, Hamer OW. [MacLeod-Swyer-James syndrome--incidental CT finding in a 21-year-old patient]. Rofo. 2008 Apr. 180(4):351-3. [Medline]. Serdengecti M, Sakarya ME, Ilerisoy ZY, Odev K. Comparison of ventilation-perfusion scintigraphy with MR angiography in patients with Swyer-James syndrome. Clin Nucl Med. 2013 Apr. 38 (4):237-40. [Medline]. Chalmers JH Jr. Swyer-James syndrome. Semin Respir Infect. 1999 Sep. 14 (3):295-7. [Medline].